The 2.5-liter QR25DE engine is technically the copy of the QR20DE, except a few details. The engine has another crankshaft, and now engine stroke is 100 mm (2.0-liter engine stroke is 80.3 mm). The connecting rods were shortened. 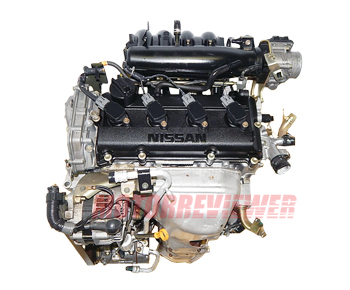 That allowed to increase the engine displacement to 2.5 liters with the same cylinder bore 89 mm. That made this engine more torque. However, that also brings more stress on engine cylinders itself, on piston rings and rods. The engine warranty is shorter than two-liter brother had, and the problem of high oil consumption is more common for the QR25DE. Some improvements were made in 2007. The intake receiver/manifold was modified. The engine got new pistons and reinforced connecting rods. The balancing system was moved slightly to a central location in the block. Also, the engine was equipped with new camshafts. The engine block still is aluminum like it was. We can say what the QR25DE has almost all potential issues as the QR20DE has, but this engine can consume more engine oil at the end of its life. There are more vibrations and run-out processes.